With Tisha B'Av in the rear view mirror, Rosh Hashanah and the High Holidays are on the horizon! I know, it's crazy to believe that another year has almost passed us by. G-d willing, the newly renovated Chabad of Huntsville space will be ready G-d willing in time for Rosh Hashana services! Very exciting! It's not too early to wish each other blessings for the New Year. May you and yours be inscribed for a Happy and Healthy New Year, a Shana Tova Umetukah filled with good health, abundant livelihood and pleasing relationships! Best wishes to you for an enjoyable and safe rest of summer! Please contact Chabad for opportunity details, if you would like to have the High Holiday kiddish in honor or in memory of a loved one. Make your experience meaningful with inspiration and insights while joining Chabad with family and friends! Wishing all our friends a Shana Tova! With blessings for a Happy, Healthy and Prosperous Sweet New Year! If you would like to reserve for more people please contact us at 646.884.1937. 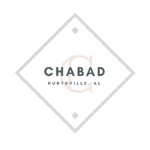 Chabad of Huntsville is completely independent and is supported by friends like yourself.